The Milwaukee Domes gift shop, Gifts Under Glass, has a wonderful selection of unique, beautiful gift ideas AND Milwaukee Domes souvenirs. The Domes gift shop specializes in artistic / educational gift items, most from local artists, for everyone on your shopping list. Hours: Monday - Friday: 9:30am - 5:00pm. Saturday & Sunday: 9:30am - 4:00pm. Bring your Domes experience home with you! 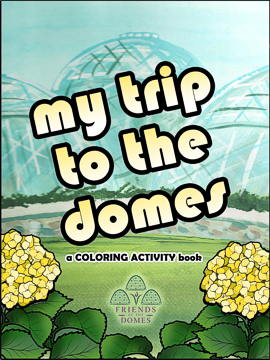 My Trip to the Domes is a coloring activity book for all ages. This original book was designed by our own Milwaukee Parks Artist and is printed with soy ink on recyled paper.